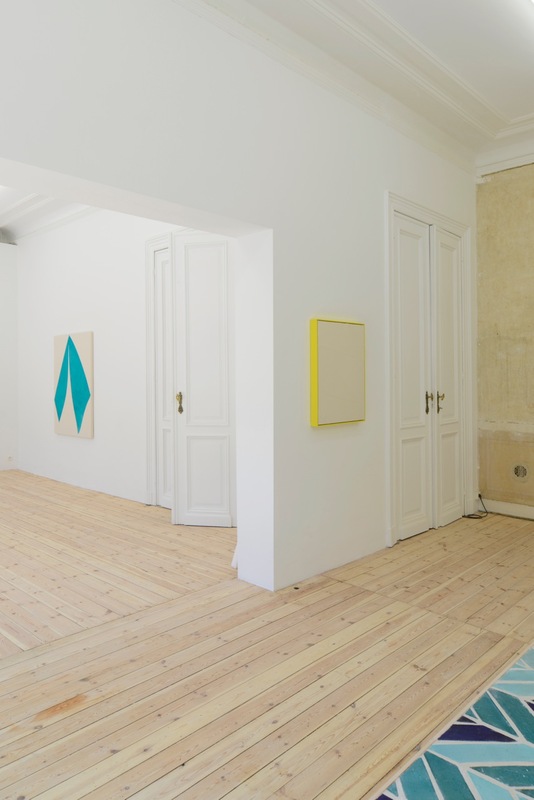 Galerie Catherine Bastide is delighted to open our new gallery space with a solo exhibition by Sarah Crowner. Exploring the architecture and patterns of the new space, the artist presents a site-specific exhibition across three connected rooms. Ceramics, textiles, and principles of interior design are presented in a continuation of Crowner’s dialogue between the fine and applied arts. With a view to establishing a more egalitarian relationship between craft and content, Crowner’s practice exemplifies a practiced symbiosis of form and process upholding an appreciation of traditional skills alongside contemporary concept. Traces of vintage wallpaper intimating the building’s bygone past remain on the gallery walls. The faded residues of inked paper transferred onto the plaster walls echo Crowner’s own creation of patterns and motifs in her paintings and handmade ceramic tiles. While drawing attention to the history of this once imposing building, a relationship is developed with a new series of paintings that are emancipated from their surface and begin to move into the space. Besides the fireplaces, alongside oversized mirrors and windows, and placed on the floor, each piece responds to its placement and has been made with its particular position in mind. The sewn canvases employ patterns derived from gestural drawings first made on pattern paper, then traced on painted canvas and completed in their stitching together. Often a canvas may use the same original pattern and the image is repeated and mirrored. Sometimes accompanied by their own chevron-patterned, grout fixed ceramic tile platforms placed at right angles adjacent to the paintings on the floor below, these measured, repetitive permutations reflect the principle of ‘joining together’. Always attuned to surroundings, the notion of adjacency pervades Crowner’s practice. Departing from the premise that nothing, including art, exists independently, it is always participating with its surroundings, context is crucial and Crowner’s exhibition derives it’s meaning from this unique backdrop and the dilapidated grandeur of this historical setting. Together with ongoing concerns regarding the body and its relationship to painting and architecture, Crowner closes down the distancing effect of the ‘white cube’ aesthetic. Painting is no longer seen as passive but as something that involves the viewer in its staging as the artist encourages us to recognize all the elements at play in the ever-evolving pattern of our environment.